It is during a world tour that Tzvika Calisar decides to go to Japan. He is 23 years old and no money in his pocket. He is suggested to work in Tokyo and here he is on a plane for Japan. What he doesn’t know at that time is, that his meeting with Shiatsu will change his life from the bottom up. 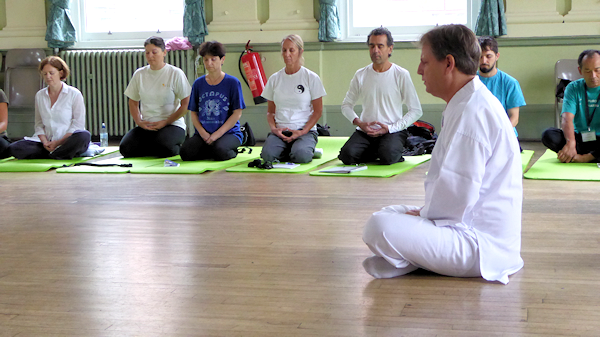 Portrait of an incredible Shiatsu teacher! Ivan Bel : Dear Tzvika, could you tell me how did you find shiatsu ? Tzvika Calisar: I was doing a world tour in 1985 with my girlfriend of that time, and I was in South America. It was a bit complicated because someone robbed my wallet with all my money. Someone told me to go to Japan to be a fashion model to make money. And that’s the way I landed in Tokyo. It works well but at one point I wanted to try something else, a japanese thing. When I went to the tourist information center, there was plenty of choices, like ikebana or traditionnal dance, but I liked the idea of trying a massage. So I went to the Japan Shiatsu School to study the Namikoshi’s shiatsu for one week. And I found that was fantastic! For the first time of my life, I enjoyed studying. But wasn’t it too complicated because of the japanese language ? Not really because we were studying the basics of shiatsu, so we practiced a lot. Even if I didn’t understand with my ears, I did understand with my eyes and hands. After that try, I went back to Israel. But soon I missed shiatsu, so I decided to go back to Tokyo for a longer time. My teacher was Toru Namikoshi, the son of the founder. I was only able to do one full year, because after that it was hard studies, with anatomy and stuff like that and no english classes. My japanese wasn’t good enough to follow. So I knocked at the Iokaï shiatsu school to study there, but unfortunatelly Masunaga had passed away a few years ago. My teacher was Kimura during all the training. Once I’ve finished the whole training, I started again from the begining, just to be sure (laughs). You have to know that Zen shiatsu is not recognized in Japan, so the training was only 6 months long. Isn’t it a bit short ? Yes, that’s why I did it twice ! I was also member of a small group of students who were alllowed to train at Suzuki sensei’s home. We had such a small room for that, that’s why only a few of us could study up there. But those trainings were quite effective and helped me a lot I must say. Also because the teaching was different from Kimura’s one. 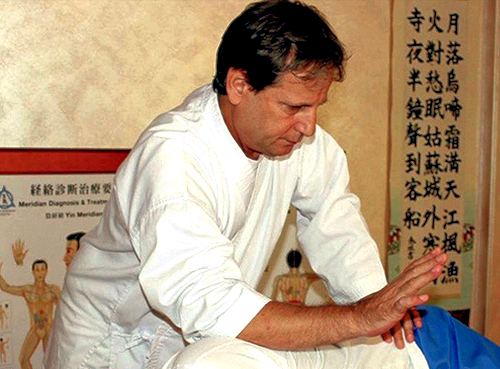 Speaking about teaching, you should know that there always have a teaching issue with Zen Shiatsu. Masunaga was an extroardinary master, but he passed away without leaving any teaching method. That’s why all other the world there is nearly as much teaching methods as Zen shiatsu’s schools. Every teachers have interpreted from the books and seminars, but no one received a teacher’s training. It’s not my point of view; this is historical fact. 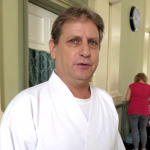 Did you g back to Israël after studying Iokaï shiatsu ? No, because I met Ryokyu Endo sensei who teached Tao Shiatsu. I spent two years with him and then I started to give Shiatsu treatments in Kyoto. During those years I’ve got married with a japanese lady. Finally, I was back in Tel-Aviv in 1990 only. At that time I wasn’t really kind to work, just give a few Shiatsu treatments and enjoy life. You know, the beach is not too far away from the city (laughs). But after two years, one patient asked me to teach him shiatsu. So I started very slowly to teach to him, then I openned a school and quickly it growed up with a hundred of students. Is this the place you’re teaching now ? No (laughing at loud)! To tell the truth my wife, my kids and I we moved back to Japan. There, I openned another Shiatsu School in Tokyo with Endo sensei. I can assure you that we were not many strangers to teach Shiatsu in Japan at that time. I spend my time between Tokyo and Canada/USA during half of the year, and the other half I was teaching and giving treatments in Tokyo. It was crazy, the rhtyhm was intense. At one point my wife asked me to go back to Israel were life was sweeter. So in the end, I lived 12 years in Japan, a life fully dedicated to Shiatsu, and 20 years with Endo sensei. Today you’re teaching Seiki Shiatsu, you own style. What is it ? With all those years of teaching and practicing, I understood that this Yin and Yang story was a trap. We are basing the diagnostic on Kyo and Jitsu notions, as much as this Yin and Yang notions. At that moment of my life I was a fanatic bouddhist. And a specialist of Bouddhism history told me that all this stuff was crap and that I had to let go with what was written in the books. I applyed that to Shiatsu. If you think about it, the old chinese masters had very few students in their whole life. If they were that strong in energetic technics, tuina and acupuncture, why did they accepted less than a decade of students ? Because the essence of the technic was kept secret and couldn’t be disclose to everyone. That’s why what we read in the books are only the public face of acupressure technic and acupuncture. This is destinated to be readen by everybody, but you can be sure that the teaching is deeper than what we can read about. When you start to look after what is not going on well in the body, Kyo and Jitsu, you connect yourself to those imbalances, because you pay attention to them, so it’s echoing. Your intention to find the imbalances is dangerous for the patient, and all the Shiatsu practitioners today tend to fix people. This is not good! In fact you reinforce the what’s going wrong inside. But, rebalancing someone help him to have a good energy flow in his body, no? Do you know what Masunaga sensei said? He said that the Kyo meridian help to clear out the bad energy from the depths while the Jitsu meridian help to expel the bad energy from the surface. If you do balance those meridians, won’t you disrupt the self-healing process in the body? We must see beyond those supposedly imbalances, and we should try to look after the primary energy. That’s what I called Seiki (meaning “true energy“). One must connect to what existed before the split of Yin and Yang, to the primary energy, the one of Oneness. Lookin in the books, I found an Aramean word to describe that state of energy: “tahiro“. Now I’m trying my best to bring back the patient to that state by releasing the Seiki in his body. How can we find the Seiki if we don’t use the Kyo and Jitsu system ? Inside the 14 meridians, one is the Seiki meridian. This one change, it depends of the person, the time, his age, the situation, and so on. So, to find the Seiki meridian, you connect to the person with the righ intention. Everything is in the intention, so if the intention is good, it resonates with the meridian that carries the Seiki energy. This way, if you want nothing, need nothing, the tsubo open their doors really deeply. You just want to free the Seiki energy. You know that you’ve got threee layers in the tsubo: the deepest is the one with the Seiki. You should not judge anything or anyone. Unfortunattely the diagnostic is a kind of judgment. But the truth is we don’t know what the patient needs exactly, because each of them are unique. By the way, do you know what does the first phases of diagnostic means? Monshin, Bunshin, Bonshin? It’s all about “Shin“, the heart. So it means that you have to look inside with your heart, which one know your intention. So the heart of the patient react to your intention, and both hearts harmonize themselves and help each other. Finally, it’s just a question of frequency. We have to accept that we know not much. Thank you very much Tsvika for all your explanations.